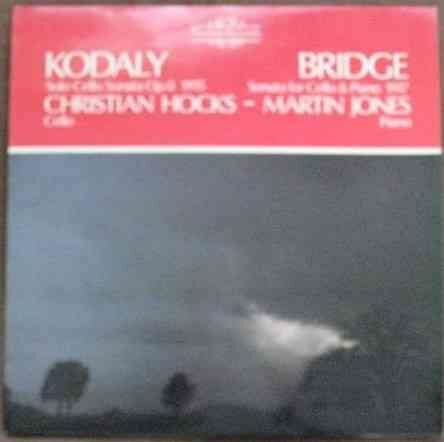 33rpm LP Record of Nimbus 2117 Kodaly SOLO CELLO SONATA Bridge SONATA FOR CELLO AND PIANO featuring Christian Hocks on cello and Martin Jones on piano. It was issued on the Stereo/Quadraphonic Nimbus Records label in 1978. UK pressing. The record itself is graded at least excellent, with no more than the odd surface mark visible when viewed under normal house lighting. Play-tested on a USB turntable. Superb sound quality with no ticks, pops or undue background noise. Just about faultless playback. The outer sleeve is graded a strong very good, with no more than light handling and storage wear and some light age spotting to the rear cover. The spine is intact and strong with no loss to the lettering. The inner sleeve has a bit of age toning but no tears or splits.